Missoula's weather is often times unpredictable depending on the time of the year. Or as locals like to joke – if you don’t like the weather, wait five minutes! The prevailing flow of air over western Montana is from the west and southwest during spring and summer months, then from the west and northwest during the winter. As the air passes over the Bitterroot Range, it loses much of its moisture on the western slopes, leaving Missoula with only about 12 to 15 inches of precipitation annually. The small amount of moisture makes for a semiarid climate, but nearby mountains provide sufficient irrigation water. 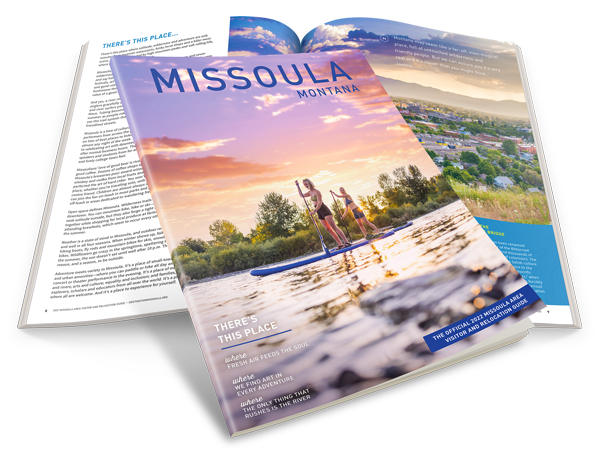 May and June are Missoula’s wettest months; an average of about 2 inches of moisture falls during each of those months. Generally, the spring months in Missoula are cool and a little damp, with almost-daily shower activity during May and June. There are about 137 growing days each year. Summer months are dry, with moderate temperatures and cool nights. The temperature does reach 100 degrees, but most nights are cool. In the winter, the Continental Divide shields the Missoula area from much of the severely cold arctic air that moves down from Canada. Many of the cold waves that slam into eastern Montana miss Missoula entirely. Under certain conditions, though, the cold arctic air breaks over the Divide and pays a visit on the Bitterroot and Clark Fork valleys. When this happens, cold air is funneled through Hellgate Canyon; severe blizzards can result. After the valleys of western Montana fill with cold air, prolonged cold spells can occur. January is the coldest month, although periods of subzero air occur occasionally in December and February. There are rare (and brief) subzero bouts in November and March. During the winter, sunshine is limited to about 30 percent of the possible. The hottest temperature recorded in Missoula was 107 on July 6, 2007. The coldest temperature was minus 33, recorded in January 1957. Below is a month-by-month breakdown of Missoula’s weather, as revealed by the 30-year average of high temperatures and low, percentage of sunshine and average monthly precipitation.